A stunning crossover ring in 18ct white gold set with a total quarter carat diamonds. There is no better way to celebrate your love. 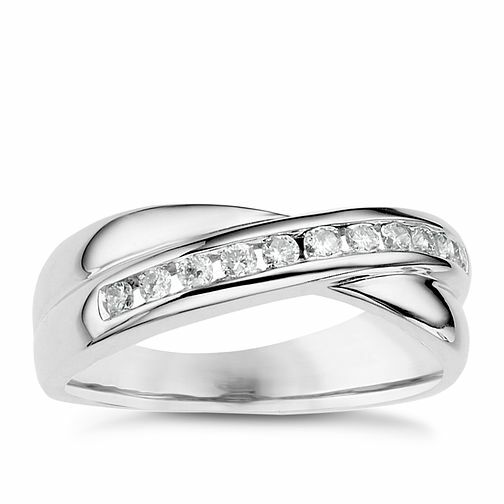 18ct White gold 0.25ct diamond crossover ring is rated 4.7 out of 5 by 3. Rated 5 out of 5 by Anonymous from Beautiful Bought this ring as my wedding ring. It fits underneath my 8 prong cluster engagement ring perfectly. I can't wait to wear it, it's so sparkly and really compliments my other ring. Rated 4 out of 5 by Anonymous from Please make in Platinum or Palladium! This is a truly beautiful ring, and excellent vallue in the 20% off sale. My only gripe is I cannot buy it because the alloys in white gold set off my skin irritations. I would buy it from you in a heartbeat in Platinum or Palladium, as these are hypoallergenic metals, but it doesn't exist! The quality of the ring itself feels lovely, and the diamonds in store appear bigger than their .25ct. I will contact your design team to see if they can custom make me one, but it won't be in time for my wedding unfortunately - bummer!